We stayed 1 night while passing through the area. The park is a short drive from I-80 (Exit 303) along multi lane busy city streets. There wasn’t much of a registration parking area. The interior roads are paved. The interior roads and turns are sufficient to maneuver larger RV’s. The sites are a mixture of back-ins & pull thrus. The parking pads are gravel. This park didn’t seem to understand the simple concept of the importance of a flat, level site as the sites were not level. Saw some coaches with their tires off the ground to get level. The P/T sites were long enough to say connected to a toad. Sites had sufficient room for opening slides. P/T sites share utility connections. They have full hook ups – water, electricity (50/30/20 AMP), & sewer. The sewer connection was well above ground making it difficult to establish a downhill flow depending upon discharge point. There was an outside table on a concrete patio but no fire pits. Distance and grassy areas establish privacy between the sites. Some of the sites appear to be extended stay sites. There were trees scattered throughout the park so satellite reception would be dependent upon your site and dish configuration. No park brochure so no information about television reception/cable. The park provided WiFi was good. Didn’t try the Verizon WiFi hotspot or NET10 phone so don’t know about reception. There was a designated fenced pet area with a grassy surface located in a corner of the park. No memory of waste collection stations around the park. There was sufficient area to walk dogs along the park’s roads. Rated this park a little higher than it should have been due to the amenities and appearance of the park. We would probably stay here again if traveling through the area. 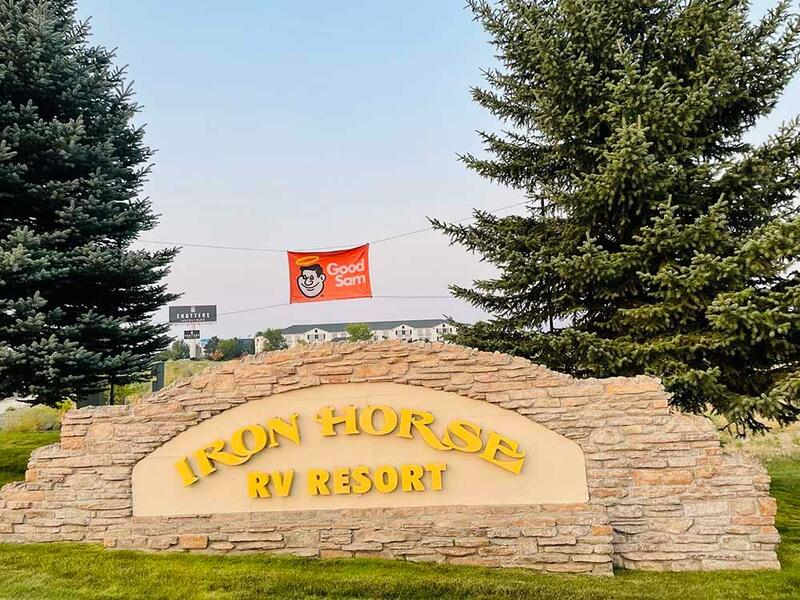 TIP: The nearby hotel’s amenities were available to the RV park guests with a shuttle available. Walmart located at the other end of town had easy large RV parking. Nice clean, quiet park. Very well kept. concrete pads, paved streets. We found the location to be within walking distance of a very nice local market to pick up a few supplies. We only stayed overnight but would definitely stay again if in the area. Our stay was 2 nights and we found our stop to be very clean, level and the park in general clean and welcoming. We were very happy with the location and how quiet it was, even with the trains. This park is highly recommended and we'll be staying here again if our travels take us in that direction! Nice overnight spot. The place was clean, and the staff was helpful. For our money the pool was more of a large hot tub, but cold. The hot tub was only warm, however it did feel good on the shoulders after a long drive. We did not use the access to the Hilton facilities for pool or spa as we felt it was too far to walk and not worth it to disconnect from the trailer. Very well appointed RV park. Wish we could have stayed longer. The price was a bit steep. This is a great park! Sites are nice and level, roads are paved, laundry and bathrooms are clean. We've stayed here several times as we've passed through the area. Class A 40’, 4 slides, pulling a toad, 2 adults, 1 small dog Number of nights stayed: 1 Would we stay here again? : No What we liked: Close to main Highway What we didn’t like: Felt park was overpriced and over rated. Sites are very unlevel. We stayed here one night only - a Saturday. Not sure if this happens every night, but trains went by all night long with multiple loud, long horn blasts. Very difficult to sleep. The space we were assigned was not level. Required 3 inches lift in front and 2 inches on the side. I didn't see any level spaces for travelers. Sprinklers were turned on for 20 to 30 minutes just as we were trying to disconnect and stow hoses and cables. Got me , all my gear , my rig and my truck soaking wet. I don't believe anyone should have to pay almost $50 a night for a gravel , unlevel space with service that includes an unwanted shower in the morning when trying to get underway. Wow. What a nice place. My wife and I enjoyed our stay here. We arrived at the park approximately 11:30am with reservations and were told check out time was noon and we could not check in until 1pm. This was the Tuesday after Labor Day and the park had a lot of vacant spots. The lady at the desk said she didn't know if our spot was empty so my husband offered to walk to where our spot was and check but we were told it didn't matter we still could not occupy the spot until 1pm and even then the maintenance people needed to inspect it. We asked what we were to do until 1pm and were told "maybe you could go shopping". Our 5th wheel is 37 feet long and we had traveled 3 hours to get to Elko. As we left the park we drove by our assigned spot and it was empty. When we returned to the park at 1pm and started to set up we noticed there was alot of dog poop at the back of our site. There was a dog walk that ran behind our RV. We will stay at this park again but not on the side where the dog walk is and I think it should be mentioned when making reservations that check in time is 1pm so no one else is inconvenienced.